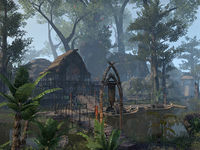 Bright-Throat Village is a settlement found in the eastern shore of Murkmire. It is home to the influential Bright-Throat tribe who are known for their diplomatic skill and artisanship. Bright-Throat Village Objective: Help uncover the source of the Bright-Throat Hist's pain. Bright-Throat Wayshrine can be found just south of the village. This page was last modified on 23 February 2019, at 01:23.